it is much easier to confirm identification on the alates (see below) than on the apterae. The overwintering eggs hatch in spring. 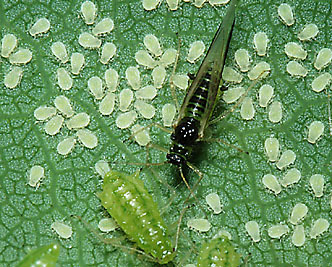 Periphyllus acericola nymphs feed on the one year shoots of sycamore, maturing to large fundatrices by mid-April (see picture below). Note the fundatrices are markedly larger than any of the other morphs. 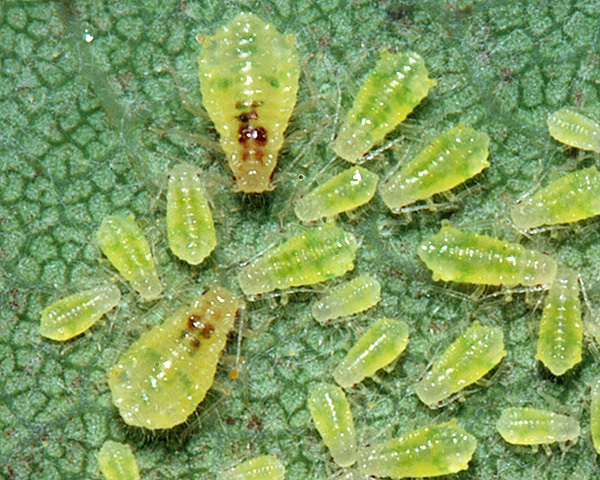 Their offspring, when young nymphs (see first picture below), move to the buds of sycamore where they feed on the very young leaves. 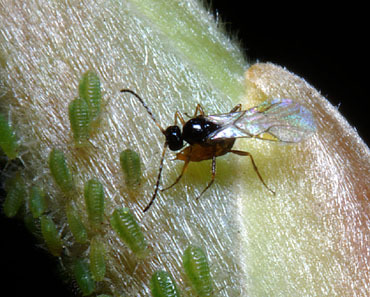 Even this early in the year they are often attacked by a braconid parasitoid, shown in the second picture above inserting an egg in the aphid's body. 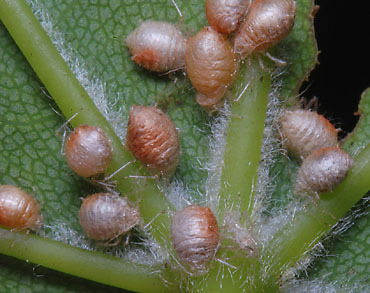 Large clusters of aphids may be parasitized as shown in the first picture above. 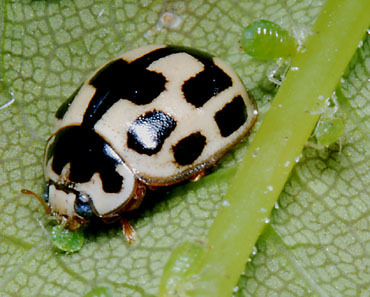 Predators also take their toll - the second picture above shows a coccinellid, an adult 14-spot Ladybird (Propylea quattuordecimpunctata), consuming a sycamore periphyllus aphid. Some (but not all) colonies of Periphyllus acericola are attended by ants, in this case by Formica rufa (Southern Wood Ant). One of the ants in the first image is making a threat display to defend the aphid (against us) by opening his mandibles (jaws). 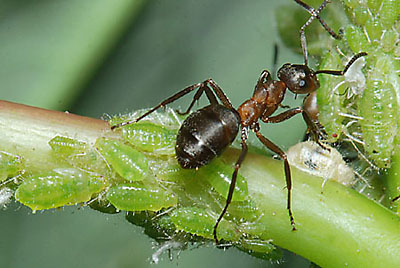 The second image suggests that they are sometimes unsuccessful in defending the aphids against parasitoids given that there is an aphid mummy on the stem. 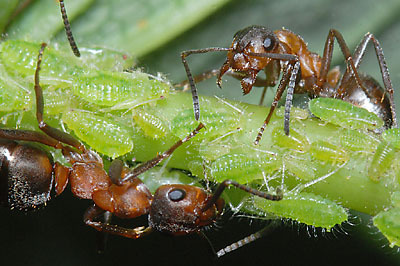 Particular species of attending ants may only protect against certain types of predators and parasitoids, and some parasitoids have evolved behaviour patterns which resemble those of ants and may thus protect them. 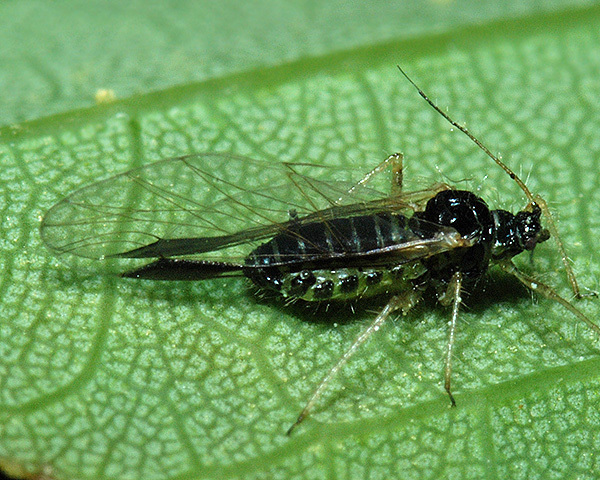 Those that survive the predators and parasitoids mature to apterae and alates. 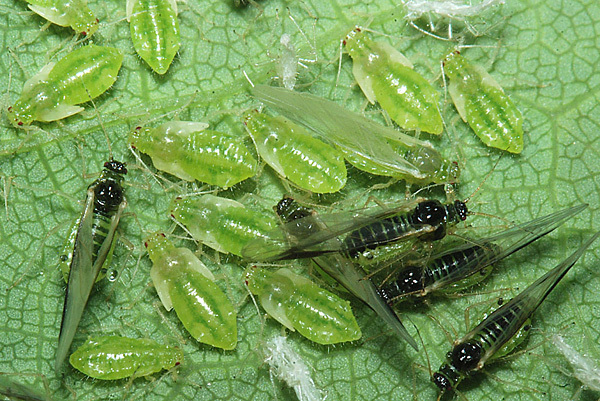 This picture shows a group of developing nymphs with wing buds and a few that have matured to adult alates. The very pale alate has only just moulted to become a winged adult. 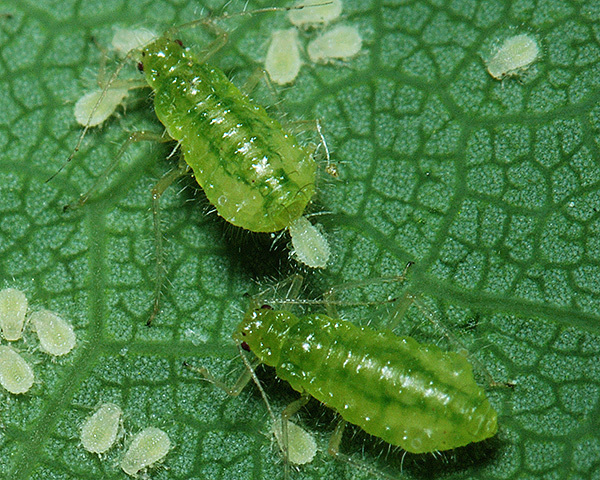 By late May the Periphyllus acericola adults start producing first instar nymphs which are yellowish white with long, pointed hairs. These do not develop immediately but aestivate through the summer. They aggregate in dense groups appearing like whitish spots on undersides of leaves. 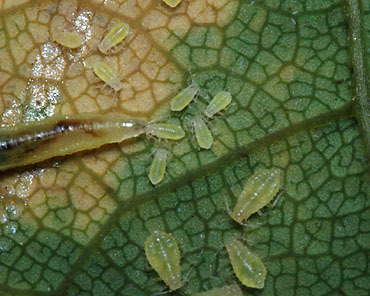 In autumn the aestivating nymphs of Periphyllus acericola resume development as shown in the first picture above. Note the apterae here have some dorsal brownish markings. Autumnal yellowing of the leaf often commences around the site of these aggregations as shown in the second picture. 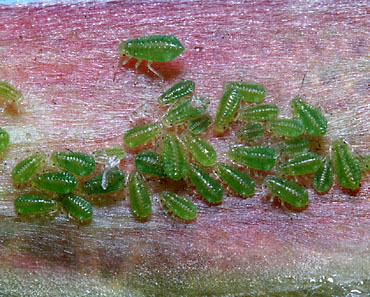 Shearer (1976) has demonstrated that aphids reared on such areas are heavier than ones reared on other parts of leaf. This suggests that the aphid aggregations act as sinks diverting nutrients towards aphid colonies. The second picture also shows a predatory syrphid (hoverfly) larva which has consumed most of this aggregation. 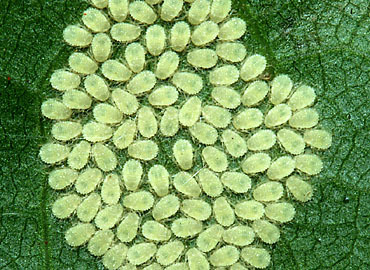 In this image, taken in October, nymphs are maturing into oviparae (egg laying females). Alate males also occur at this time which mate with the oviparae. The oviparae then lay eggs on the twigs and branches of the sycamore. Periphyllus acericola has been recorded from 3 Acer species (Acer campestre, Acer granatense, Acer pseudoplatanus). 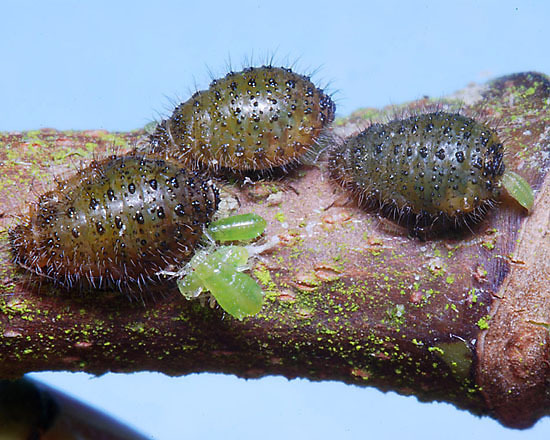 Blackman & Eastop list 12 species of aphid as feeding on Acer pseudoplatanus (European sycamore) worldwide, and provide formal identification keys. Of those aphid species, Baker (2015) lists 8 occurring in Britain: Aulacorthum solani, Drepanosiphum acerinum, Drepanosiphum dixoni, Drepanosiphum platanoidis, Macrosiphum euphorbiae, Periphyllus acericola, Periphyllus testudinaceus and Stomaphis graffii. There appear to have been no studies on the effect of Periphyllus acericola on the host plant. 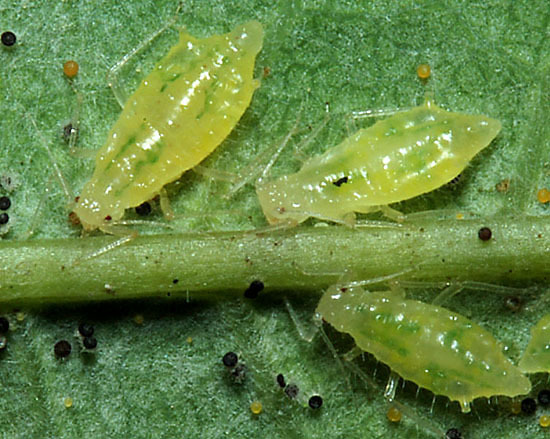 Since aphids can be very numerous, the amount of sap removed will be considerable, which would reduce the growth rate of the host plant. If the population is ant-attended, the adverse effects would be counteracted to an unknown degree by predation of leaf feeders by the ants.